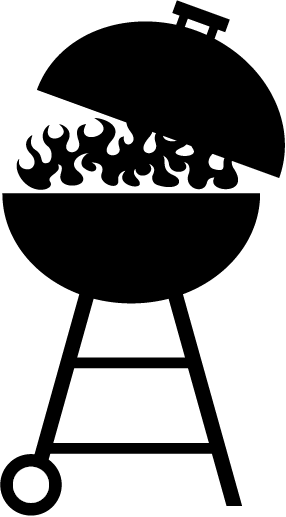 NDSU › Publications › Food and Nutrition / Quick Facts: Grill Something Different! Who knew an entire meal could be prepared on the grill? Try these recipes the next time you want to ignite your guests' taste buds. Preheat grill. Combine all ingredients (except chicken wings) in a small saucepan and let boil for two minutes. Remove from heat, pour into a large bowl and let cool. Add chicken wings to the marinade and marinate in the refrigerator for two hours or more. Grill over medium heat for 10 to 15 minutes or until cooked through. Serve chicken wings with celery and carrot sticks. Omega-3-rich salmon steaks hold up well on the grill. Plus, since they’re usually sliced to a uniform thickness, they cook evenly. Before you light the fire, coat the rack with cooking spray so the fish won’t stick to it. Mix the spices together in a small bowl. Rub the mixture evenly over the salmon. Grill for five minutes per side, drizzling lightly with a squeeze from the honey container (about 1 tsp. per steak) just before they’re done. Cut your favorite vegetables (bell peppers, mushrooms, asparagus, onions, zucchini, summer squash, potatoes) into chunks. Lay out a piece of aluminum foil and spray with cooking spray. Place vegetables in a bowl; add enough olive oil or cooking spray to coat. Season with your favorite seasonings (Mrs. Dash, lemon pepper, thyme, rosemary, garlic, etc.). Pour vegetables onto aluminum foil and seal all sides. Place on a preheated grill. Cooking time varies depending on size and type of vegetables. Most vegetables need four to five minutes, then stir and grill for another three to four minutes until vegetables are crisp tender. Potatoes may take longer (30 to 40 minutes), so you may want to do those separately. While you probably don’t think a lot about grilling fruit, these little grill packets make a delicious dessert. Top them off with vanilla ice cream and your guests will be pleased. Wash and halve peaches. Remove pit. Place peaches on aluminum foil so that you can fold up the foil and seal the peaches in. Spoon 2 tablespoons of berries into each peach half. Sprinkle 2 teaspoons of brown sugar and 1 teaspoon of lemon juice on each half. Fold foil and seal. Place on hot grill and cook for 15 to 18 minutes Turn once. Serve right out of the foil. Peel back the husk, but don’t remove. Remove the silk and close the husk back up. Submerge the corn in water for about 15 minutes. While the corn is soaking, fire up the grill. Remove the corn from the water and shake out any excess water. Note: If you wish to season the corn before cooking, you can pull back the husk and add your favorite seasonings. Be sure to close the husks and twist shut before placing the corn on the grill. If using a charcoal grill, turn the corn every 10 to 15 minutes. For gas grills, keep the heat on medium-high and turn every five minutes. The husks will turn brown and even may start on fire. Let them cook, turning the corn often. The water that they soaked in is steaming the corn from inside the husk. Corn usually takes about 30 to 45 minutes; after grilling a few times, you will get a feel for how long they need. When done, use a tong to remove the corn from the grill (they are very hot!). Peel back the husks. You may want to run the corn under hot water to remove any ash. Let your mouth guide you next. Some people eat their corn plain; others use a little butter with some salt and pepper. For a new twist, try mixing some olive oil with your favorite seasonings and brush it onto the corn.